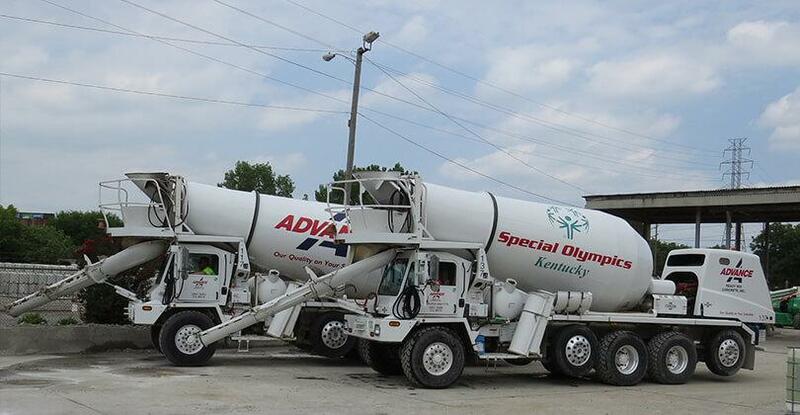 Advance Ready Mix has broken the mold of our typical truck design to showcase and bring awareness to several non-profit organizations in the Louisville area. The following are organizations that we support both financially and through this awareness program, along with the mission of each. USA Cares – Provides stability for military families in crisis. USA Cares exists to help bear the burdens of service by providing post-9/11 military families with financial and advocacy support in their time of need. Down Syndrome of Louisville– Their mission is to improve the lives of people with Down Syndrome, and their families, by providing support, information, education and advocacy for their rights and concerns; thus enabling each individual to reach his or her full potential. Special Olympics – Is a global movement of people creating a new world of inclusion and community, where every single person is accepted and welcomed, regardless of ability or disability. They are helping make the world a better, healthier, and more joyful place – one athlete, one volunteer and one family member at a time. Louisville Metro Police Foundation – The Police Foundation is dedicated to improving the Greater Louisville community and making our city a safer place to live, work and visit by supporting the men and women of the Louisville Metro Police Department. Piggies for Preemies – The Piggies for Preemies program challenge children and individuals throughout the region to fill piggy banks with spare change. Funds raised support premature babies in the neonatal intensive care unit at Norton Children’s Hospital.